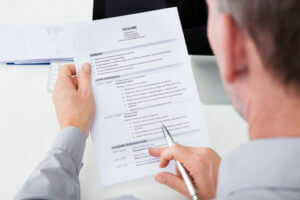 Does Your Resume Have the Skills that Recruiters Want? If you want to impress recruiters with your resume, make sure it shows the skills that will attract them. Learn more in the following post. Job seekers, if you’re wondering how to impress recruiters with your resumes, the following post has seven tips that will help you achieve this goal. While college graduates may bring career skills suited to the jobs they have applied for, it’s essential that they show potential employers how important these skills are. Get some examples of how to do so in the following post. When writing resumes for recent graduate jobs, employers want to see if you stand out from other applicants. In the following post, learn seven cliches you shouldn’t use if you want to attract companies. Close up of person looking at a resume. Photo courtesy of Shutterstock. You want to be the siren of the job market, yet you can’t even secure a single interview. Have you ever wondered why such a cruel thing only happens to you when others are getting 2 to 3 interview calls in a week? It is undoubtedly because your resume isn’t just as chic as you wanted it to be.